As Canadian citizens, we are outraged that millions of people in Yemen are facing starvation because of Saudi Arabia’s relentless campaign. As one of the biggest supplier of arms to Saudi Arabia, you have a duty to act and protect Yemen’s civilians. We call on you to suspend arms exports to Saudi Arabia immediately and use your influence to ensure Canada's Saudi allies allow unhindered access for humanitarian aid supplies. A child in Yemen dies every ten minutes. 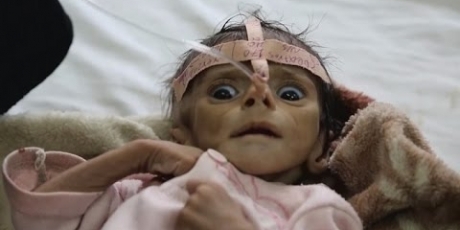 But Yemen’s kids aren't just starving to death: they are being starved. Deliberately. And our government is one of the biggest suppliers of the coalition who is doing it. Just last year our government signed an $11bn arms deal with Saudi Arabia -- the leader of the coalition blocking aid into a country where 4 in every 5 people need emergency assistance. This week, the conflict enters its third year and a catastrophic new offensive is about to be launched. If we can raise the pressure now, the government could be pushed to suspend arms exports and get their allies to allow desperately needed food and medicine in. Join the urgent call to Prime Minister Trudeau to stop this shame.